It’s been awhile since I posted a report – mainly because the weather was bad during thanksgiving and i haven’t taken many pictures of the fishing I’ve done. However, the weather has been great the last week or so – lots of beautiful calm days and the water has really cleared up from the muddy mess of last week. On Thursday the 2nd I fished with Captain Dean Lamont of Cyrstal Coast Adventures – and despite muddy water conditions, we managed to boat a good number of nice speckled trout. The bite was primarily on live shrimp but we managed several on the fly-rod as well as on both grubs and mirrolures. In three or so hours, we ended up catching 10 or so 2-4lb fish (the largest were just shy of the 4lb citation mark). We kept a few for dinner, including two that went 3lb 11oz and 3lb 12oz. The picture is of the fish we kept for dinner – we released most of the fish. 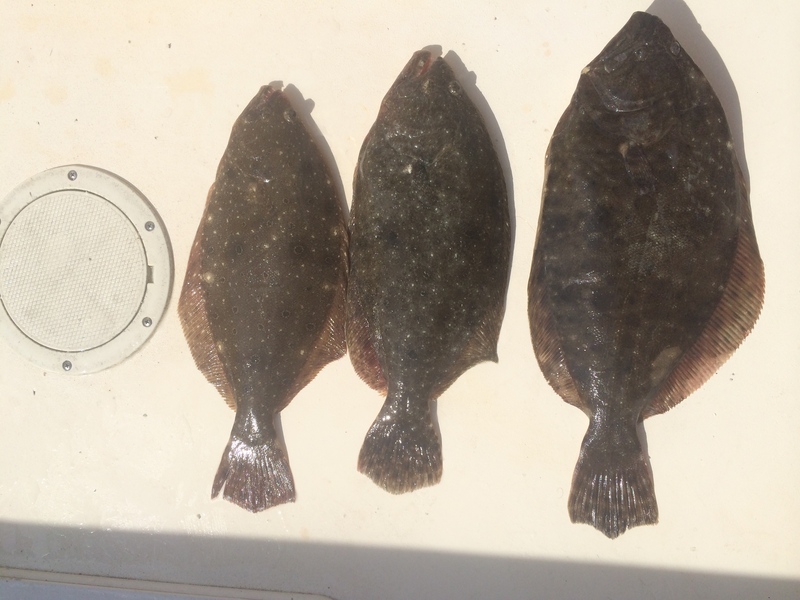 We also had a couple bonus flounder thrown in there – always nice for the fryer. By the way, the flounder bite is still good at the ARs. Friday was bumpy but we still managed to catch probably 100+ spikehead trout on grubs – it was every cast for 2 hours. On Saturday the 4rth, I went out with Captain Gordon Churchill to search for some of those early stripers. The water was glassy calm and we covered over 40 miles – the bait just wasn’t there and either were the stripers. I did hear of some sighting that afternoon – but the fish that have been caught so far can be counted on one hand. We just need some good ol’ cold weather!!!! Gordo and I switched tactics and went to a few of my trout holes – the bite was very good and we managed 50+ fish on artificials in a couple hours – most of the fish were 14-15″ with some 2-3lb fish thrown in. There was a good bite at the “parking lot” but we didnt want to deal with the crowd. Sunday the 5th – the bait appeared! 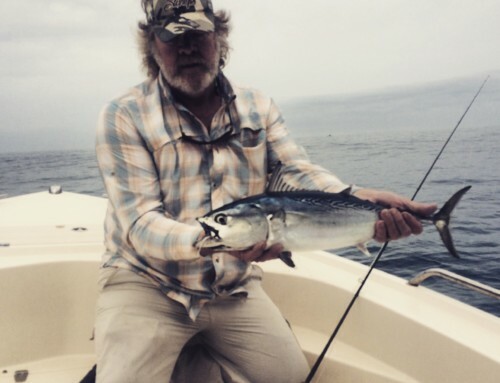 Giant pogies (I snagged many 13-16″ 2-4lb pogies) all over the shoals and east side with few predators with them. There were some albies in the area but we decided to go trout fishing – the bite was the same as the day before, constant hookups in the beautifully calm water. I lost count of all the fish we caught. There was also a good red bite in the shoals and in the surf. Monday the 6th – the water was slick. 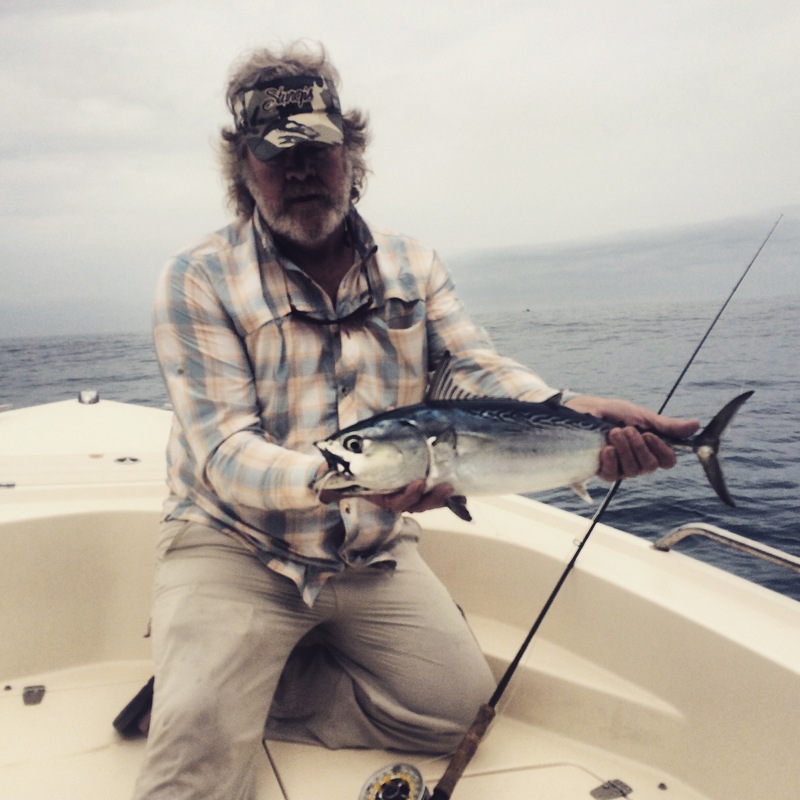 The highlight of the day were all the bluefin tuna – we saw them skying and busting like albacore all over the place. It’s going to be a great season – the fish we saw are huge and very close to the beach (very normal this time of year). I’ll have to get my gear ready in case anyone wants to do some low-budget, small boat C&R bluefin. The trout bite was the same – constant. It’s been so constant that i’m looking for a bite other than specks. Can you believe I said that about my favorite fish? !